MARA Colts Football is providing a sports clinic that is available to anyone in any sport. Please read the description for the clinic and use the register link to sign up. 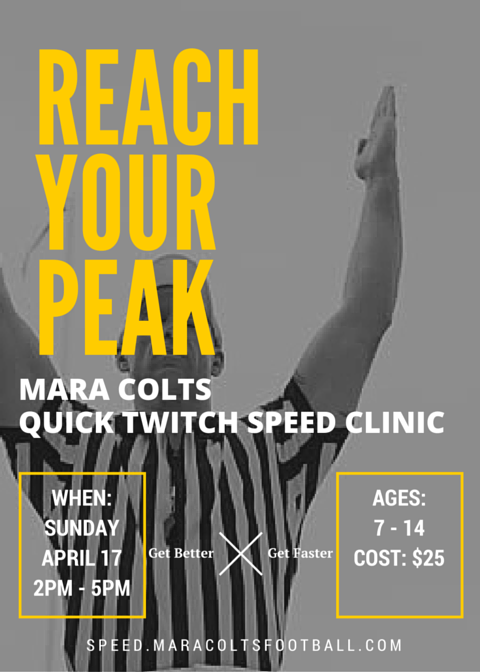 The MARA Colts Quick Twitch Speed Clinic is geared toward all sports that are ground based and need speed! The focus will be on the biomechanics of running and proper warm-up/cool down procedures. The concept is to teach kids how to move more efficiently to become faster runners, while decreasing their chance of injury.